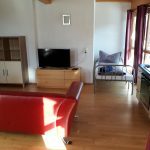 There are very few apartments in St.Anton where you can literally ski in / out of the front door but this great apartment is just such a place. 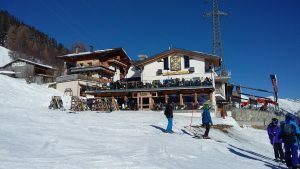 Situated right on the slopes so that you literally go out of the door onto the piste. 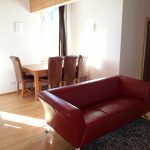 It is a very spacious apartment with very large front and rear balconies giving great views over the slopes on St.Anton. It has three good sized triple bedrooms and will sleep 9 people. and relax. There are two HD smart TV’s which connect to the internet so you can use Netflix. There are large triple glazed ceiling high windows in the living areas which are south facing so they are flooded with warm sunlight. There are two shower rooms, each fitted with the usual washbasin, toilet and shower cubicle. There is a large mirror with good lighting in each shower room. We supply top quality large bath sheets, hand towels and hair dryers for your extra comfort. Bedroom 1 is a very good sized triple bedroom with plenty of wardrobe space and bedside tables to the side of each bed. The duvets & pillows are of the good quality and we supply large bath sheets too. There is a large balcony that looks back up the slopes behind the apartment. 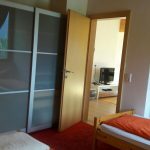 The second bedroom is still a good size and again is a triple room. Plenty of floor to ceiling wardrobe space for all your clothing. bedside table are to the side of each bed and you also have reading lights above each bed. Bedroom 3 is again a good sized bedroom with two single beds which can also be used as a double. 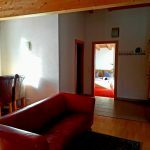 There is also the option to have an extra bed in here to make it into a triple room. Plenty of wardrobe space for all your clothing and kit. There are large windows looking out across the slopes behind the apartment. 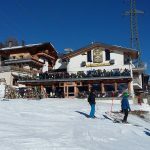 Because this apartment is literally right on the slopes and is situated by some of the world renowned apres ski bars it makes it an amazing location for those wanting to enjoy the apres ski that St.Anton is famous for. 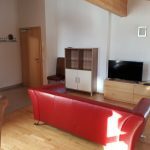 This is also a great apartment for those visiting with a young family or looking for a quiet location. As the apres ski bars close by 7 – 8pm after this time it is one of the most peaceful locations in St.Anton. Best of all is that in the mornings you can get your kids up and ski directly down to the lifts or ski school. In the afternoon you ski directly back to the apartment. Even before 7pm when the apres ski is ongoing the sound inside the apartment is not a problem. 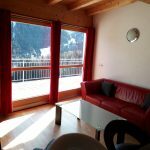 One of the best things with this great apartment is the extremely large front balcony that looks over the piste and down onto St.Anton. The views are truly amazing. 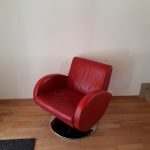 For those wishing to go to the village centre for the supermarket or to enjoy the nightlife we also include a free taxi service in the evenings. There is a secure ski & boot storage room and also a washing machine & dryer.